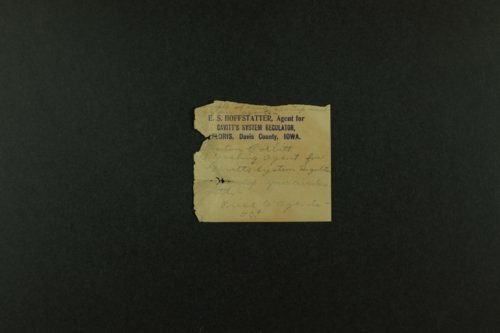 Correspondence and legal documents relating to the impersonation of Boston Corbett by John Corbit. Boston Corbett was the man who killed John Wilkes Booth following President Lincoln's assassination. Corbett moved to Kansas in 1878 and lived in a dugout near Concordia, Kansas. In 1887, Corbett was given the position of assistant doorkeeper for the Kansas House of Representatives in Topeka. However, when he brandished his pistol during a session of the legislative that same year, he was arrested and sent to the insane asylum in Topeka. In 1888, he escaped and his whereabouts remained unknown until his presumed death. John Corbit was operating as a sales agent in Texas for the W. W. Gavitt's Medical Company in Topeka after having convinced them that he was Boston Corbett. A marriage license for Mr. John Corbit and Miss Effie Britz, dated October 2, 1899 in Wichita Falls, Texas, is also included. On August 20, 1904, John Corbit testified before a U. S. pension examiner that he was Boston Corbett. The distrist court in San Angelo, Texas found John Corbit guilty of perjury and sentenced him to three years hard labor in an Atlanta, Georgia penitentiary.